11. Stir cornstarch, stock, soy sauce and sesame oil in a small bowl until smooth. Heat 1 tablespoon Zoye Low Saturated Fat Premium Vegetable Oil Premium Vegetable Oil in 12-inch skillet over medium-high heat. 22. Add shrimp; stir-fry until cooked through. Remove from skillet. 33. Heat remaining Zoye Low Saturated Fat Premium Vegetable Oil Premium Vegetable Oil in skillet. 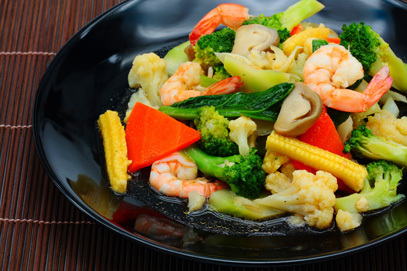 Add vegetables, ginger and garlic powder; stir-fry until vegetables are tender-crisp. 44. Stir cornstarch mixture into skillet. Cook and stir until mixture boils and thickens. 55. Return the shrimp to the skillet; cook until mixture is hot. Serve over the rice.